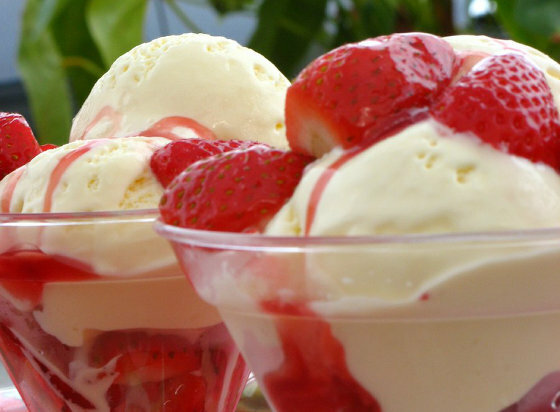 Ice cream is a wonderful treat any time of year, but is especially loved during the summer months. While buying it at the store is what most people choose to do, it can be made at home with or without a machine. If you want to make your own, follow these steps to learn how to make ice cream. Making it with a machine is the easiest way to make your own. There are many different machines available on the market for less than $50. You can purchase any number of premixed flavors and follow the directions on the packet to make it with your machine. If you really want to go homemade, you can prepare an ice cream base with the recipe of your choosing and then follow the instructions to finish it based on the manufacturer of your machine. The main difference between using a machine to make your ice cream and making it without a machine is the machine makes a smoother, creamier end result. When choosing a machine, consider the cheaper machines are known as "cold accumulating" and will likely have a bowl which needs to be frozen before you can start making the dessert. With the pre-freezing time, you can generally only make one batch per day unless you have other bowls on hand. The other, more expensive type have models that start out around $250. These are known as ice compressors and can be quite noisy. Making ice cream without a machine is possible, but many people find it more difficult than using a machine. The key to making it without a machine is to break up the ice crystals as it freezes to ensure the end result is smooth and creamy. For the best potential for a smooth and creamy ice cream, you should use a custard based recipe and keep in mind that the richer the recipe is, the easier it will be to get a creamier result. For the best result, you should eat it relatively soon after it is made. Prepare your mixture as according to the recipe of your choosing. Pour your custard mixture into either a deep baking dish, or a large plastic bowl and place it in the freezer. Check the mixture after 45 minutes. Take it out of the freezer and use either a spatula or a hand mixture to stir and beat it vigorously to break up the ice crystals. Put the mixture back in the freezer for another 30 minutes. Take it out and repeat the stirring process. Put it back in the freezer and check it again in another 30 minutes. After about two to three hours, the mixture should be firm enough to reach an ice cream consistency. Top with your favorite toppings, serve, and enjoy!